Mothers day is almost here and what better way to show her that you care than by making her a nice home cooked meal? A great way to do this is in the form of a breakfast or brunch for her after wakes from sleeping in. A while ago I made some quinoa cakes , basically a fritter made with quinoa, and I thought that they would also be great when made with different flavours such as asparagus which is in season right now. Although asparagus quinoa cakes are darn tasty all by themselves they are not enough for a special brunch so I decided to top them with some more asparagus along with some smoked salmon, a poached egg and a buttery, lemony hollandaise sauce! 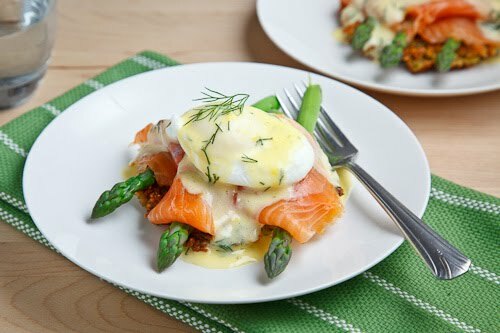 I am sure that these smoked salmon asparagus quinoa cake eggs benedict are sure to please for any special occasion! 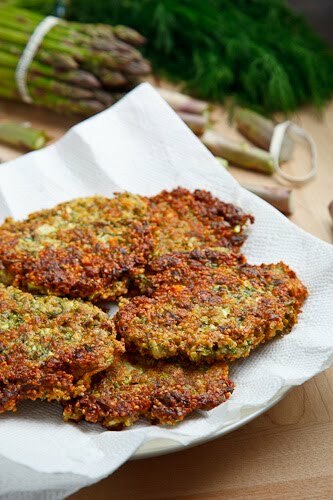 The asparagus quinoa cakes are pretty easy to make; you simply give some fresh asparagus a few pulses in a food processor and mix it in with the cooked quinoa along with some eggs and flour to bind everything together. These quinoa cakes are seasoned with green onions, garlic, fresh dill and parsley along with some crumble feta cheese. After the quinoa cakes are made it were it starts to get tricky and you will start wishing that you had four arms. You want to use both the hollandaise sauce and the poached eggs soon after they are cooked so they do not get cold but you can only make one at a time. I like to make the quinoa cakes and blach the asparagus ahead of time and then start bringing the water for the poached eggs to a boil just before I start the hollandaise sauce with the eggs cracked and waiting in separate bowls. This way as soon as the hollandaise sauce is ready you just have to pop the eggs into the water and cook for 2-3 minutes. Although this recipe can be a bit tricky, it is not too difficult and well worth the effort! 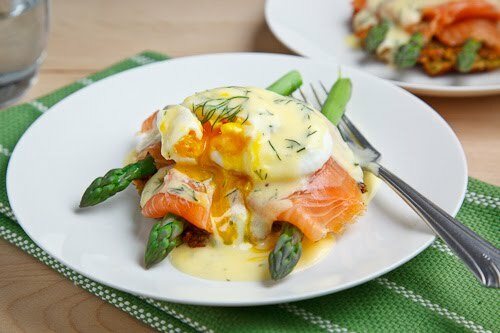 Option: Prosciutto would also be great in these eggs benedict instead of the smoked salmon. bottom of the bowl touching the water. Place a large pot of water on one burner over medium heat for the poached eggs. On a separate burner, bring some water in a double boiler to a boil, reduce the heat and let water stop boiling. Place the egg yolks in the top of the double boiler and whisk until they begin to thicken. Add 1 tablespoon of the hot water, whisk until the sauce begins to thicken again. Repeat 3 more times. Remove from heat and slowly whisk in the melted butter. Season with the dill, salt and pepper and set aside. Crack an egg into a bowl, swirl the water in the first pot and pour the egg from the bowl into the water and repeat for another egg. 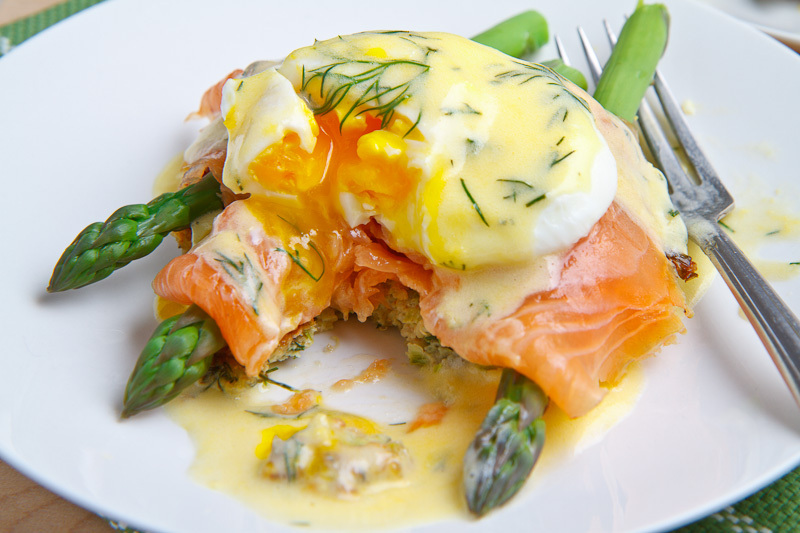 Place the asparagus quinoa cakes on plate, top with asparagus, smoked salmon, poached egg, hollandaise and garnish with dill. Asparagus and feta quinoa cakes with plenty of fresh herbs. Simmer the quinoa in the water until the liquid has been absorbed and the quinoa is tender, about 15 minutes and let cool a bit. Mix the cooked quinoa with the asparagus, green onions, garlic, dill, parsley, eggs, flour, feta, salt and pepper, adding more flour if required. Spoon the mixture into the pan and form patties of any size that you desire and cook until golden brown on both sides, about 2-4 minutes per side, and set aside on paper towels to drain. What a beautiful dish Kevin! Perfect for a spring breakfast. Oh!My! Looks fantastic! Will be e-mailing this recipe to my son before Mother's Day!!! Thanks so much for a great Mother's Day Brunch! lol!!!! Look delicious Kevin I love eggs Benedict! I am the biggest fan of eggs benedict and am always looking for new variations 🙂 This looks FANTASTIC! Two words to make this easier: blender hollandaise. Make the blender hollandaise and put the blender container into a bowl of hot water. Keeps the sauce warm while you assemble the dish. Works like a charm! Just lovely! Great execution. Any Mami would love this! This dish should be the greatest excuse to wake up early in the morning. Kevin, every single ingredient in this dish is a favorite of mine. You're welcome to come to NYS and cook my breakfast anytime! BTW, excellent photos–so bright and clear. I made this for Mother's Day and it was excellent! The smokiness of the salmon, the fresh asparagus, the lemony sauce…delicious. The only thing I changed was to roast the asparagus. Had lots of extra quinoa cakes (followed the recipe but replaced fresh herbs with dried and used quinoa flour to make it gluten-free) and have been enjoying them on their own with hot sauce. Thanks for the great recipe! You can make poached eggs ahead! This is standard for restaurant cooking. Make your poached eggs the day before or even two days before. Cook them until they are just done enough so you can take them out of the water and place them in Icy water with ice cubes to stop the cooking. Put them into the refrigerator still in the water. When You need them, you just have to take them out and dip them into simmering water only until they are heated. Makes it SO MUCH easier! Unknown: Poaching the eggs a day ahead and then reheating them sounds like a great idea that will make things much easier! I will definitely have to try it next time! Do you cook this at all, before grating, or do you grate it raw and let it cook while the cake is frying? Charlie: The asparagus is grated raw and it will cook when the cake is frying. Enjoy! We're having this tonight for supper. Tried this the other night for supper, and I have one word…delicious! Although I do have a question of the cakes. I grated the asparagus in my food processor and it came out gloppy. My cakes were on the heavy side. My Mama is going to be 91 in September. She likes her food very plain and overcooked. She gave this a 2 thumbs up and said it was a keeper recipe !!! Charlie: I'm glad you enjoyed it! The food processor is going to give a finer grate than hand grating since it is taking the asparagus top down were as by hand grating you can do it lengthwise and get nice long strands of asparagus. The food processor is easier and much quicker though so you can place the grated asparagus in a tea towel and try to squeeze out any excess liquid and that will prevent the cakes for being heavy.